A community celebration of Joe’s 27-year contribution of public service. Funds raised from this event will go to The Stop and Progress Toronto, two organizations who work tirelessly for a Toronto that Joe envisions. Join Joe’s family, friends and community for a wonderful evening of sharing, laughter and memories. Tickets are $20 or pay-what-you can. For alternate ticket pricing or to donate a ticket, please contact joescommencement@gmail.com. This is a family-friendly event, with fun activities and diverse entertainment throughout the night as well as a silent auction. Food and drinks will be available for purchase (cash only). You are welcome to drop in at any time throughout the night. Programming is forthcoming and will be posted at a later time. Thank you for joining us! 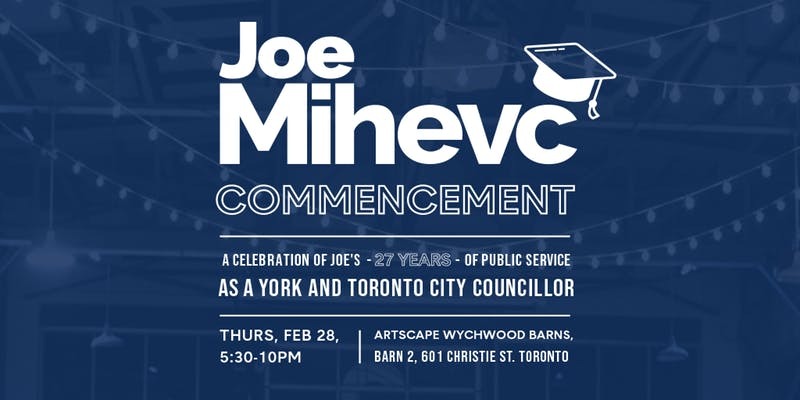 It wouldn’t be a Joe Mihevc event without community, so please bring your family and friends!